Many patients get intimidated by the price and process of dental implants, but your dentist wanted to give a few reasons why their price can be misleading. It’s true that the upfront cost for dental implants is high, but the key is to pay attention to their long-term aspect. Unlike other tooth replacement options, such as dentures or dental bridges, you’ll be getting a solution that is less expensive after factoring in replacement costs, wear and tear, function, and aesthetic. Here’s why you should consider dental implants in Fort Worth first and foremost. Dentures have become popular over the years due to their quick solution to tooth loss and low upfront cost. However, many patients believe they can make their dentures last forever, even though their average lifespan is between 5 and 7 years. That’s assuming that you make the effort to give them proper care. In most cases, patients need to replace them sooner either because they become damaged from poor care, or because they no longer fit. To make them fit, your dentist needs to reline them with new material or reshape them so they don’t cause damage to your gum tissue. That means you’re spending a couple thousand dollars every year, which can start to add up quite quickly. That doesn’t include the cost of relining and replacing dentures if they don’t fit anymore or become damaged. Dental bridges run into a similar problem. While they are great for replacing multiple teeth at a time, they will eventually require replacement after a certain time. They typically last for about 10 to 15 years, but this also depends on your oral care and your health prior to treatment. 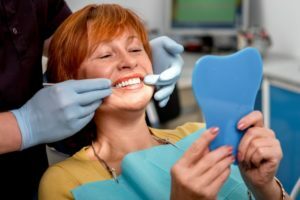 Unlike implants, dental bridges also don’t provide all of the same benefits, other than improving your smile’s appearance, make chewing easier, and prevent remaining teeth from shifting. Dental bridges can cost between $3,000 and $3,600 when totaling all the restorations needed to make them. Replacing them every 10 years will cost you close to $10,000 over a thirty-year period. All the parts necessary for dental implants will cost between $3,500 and $5,500, but have almost no replacement costs over the same period. With regular oral care, implants can save you thousands compared to bridges. While the cost is high upfront, you’ll only be forced to pay more in the long-term. Schedule an appointment with your implant dentist in Fort Worth to get started and learn your eligibility today! Dr. John G. Boyd earned his Doctor of Dental Surgery degree from the University of Texas Dental Branch in Houston. He’s also a member of the American Academy of Cosmetic Dentistry, which helps him stay updated on the best techniques for making your smile look perfectly restored. To learn more about his practice, contact him through his website.